There are many inexpensive 4-digit 7-segment LED displays available but these usually require some additional driver software or hardware chip to make them operational. 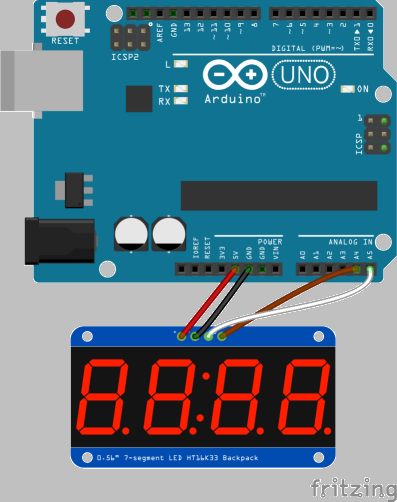 However, Adafruit has developed a range of LED displays with accompanying driver chips alongside software libraries for the Arduino. There are many different devices supported - 8x8 single and bi-colour matrix, 4-digit 7-segment, LED bar, etc. These devices usually come as a partially assembled kit with only minor soldering required. The kit comprises the LED display, a single row header and a small PCB with a surface mounted Holtek HT16K33 chip already fitted. The interface is I2C, which means only four connections are required: 0V, +5V, clock and data. Each device has three pairs of solder pads that can be connected to set the device's address - 3 bits allows 8 devices on the same I2C bus with address 0x70 to 0x77 inclusive. Leaving a pair unconnected gives a value of 0; connected, 1.